Place the raisins in a small dish. Cover with the juice of the orange and 2-3 tablespoons hot water. Plump and soften the raisins for 5 minutes. Combine the fennel, raddichio, scallions and parsley in a bowl. Add the plumped raisins in juice and the pine nuts to the salad and toss with balsamic vinegar and EVOO (three turns around the bowl in a slow stream) to lightly coat the slaw. Season the salad with coarse salt and pepper, to taste. In Recipes-list.com we have selected the most viewed recipes from category - uncategorized . Enjoy the best recipes specially selected for you! 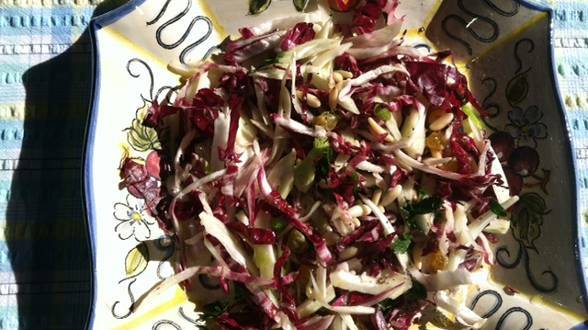 Fennel Slaw Salad is the right choice that will satisfy all your claims.